temporary solution because she doesn’t play well with other cats and I don’t have enough space. She deserves a good home! Do you know someone who wants a feline companion? ETA: this is the kittypile. Your eye candy for February: Blooming scars (2009) in lampwork glass and found wood. 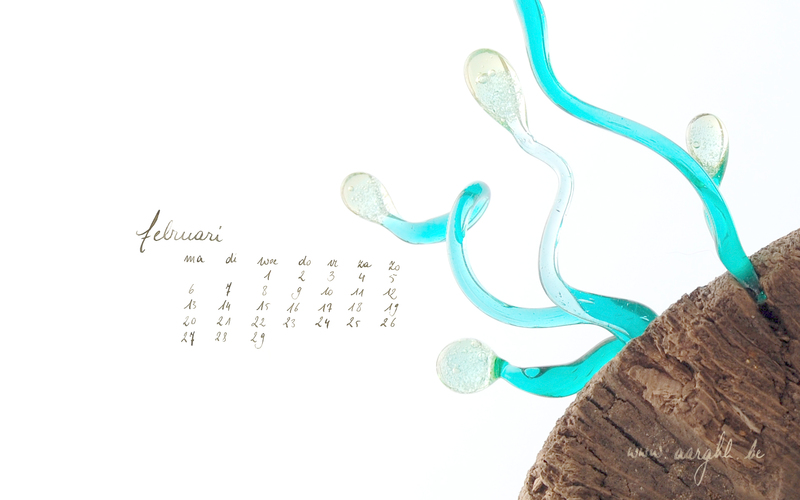 Desktop calendar for February: click to download! Glass stems sprouting from cracks in a piece of salvaged wood. It’s the same piece you can see on my avatar (here and here). With glass, metal and fire lacking I have to do with what I can find. Quite literally: this is a little collage made out of a handful of thorns, 3 butterflies, 2 bees, 4 cat’s whiskers (probably Yang’s and Shelley’s), a bumblebee, a mosquito and a pupa. I’ve collected them over the years, they died of natural causes (or quasi natural, as one of the butterflies was trod on by a toddler ). I love the organic shape of wings, of thorns, of whiskers…They seem perfect even though each one is different. …or how a full moon sheds light on the netherworld as well. Or not? Jack -yes, Jack! !- came by on his daily nightly walk and obligingly posed for about half of the shutter time of the camera. Yes, I’m giving away a set of 3 glass pins from the Infected! series! I will announce the winner on March 30th, so comment away! 😀 Good luck! On a side note, would you consider signing this Petition for a spaying/neutering policy for stray cats in Ghent – the animal rescue where I got Isaura from (you can see more of her here) issued this petition to raise awareness about this -right now the city doesn’t have a policy and stray cats are mostly all euthanized…This has to stop! Neutering/spaying combined with resocializing and finding new homes for the cats is a humane solution. This is what volunteer organizations like Kat zoekt thuis do, but with very little means or government funding. We’re far from a decent general policy concerning stray animals here in Belgium, but every little helps, even if it’s just a signature. Thanks!